Are you one of the women who wonder if you can practice Qi Gong and Taijiquan/Tai Chi during pregnancy? Even though I cannot give you any medical advice, I am a mother of two wonderful children. And I would love to share my own personal story about doing Qi Gong and Tai Chi during pregnancy. I started practicing Taijiquan and Qi Gong in 2004. And I got pregnant in 2010 and 2012. So I already had a couple of years of experience when I got pregnant. Thus for me it was out of question that I wanted to do Taijiquan and Qi Gong while pregnant. There are so many benefits and I was sure I would need the energy during my pregnancy. I do know a lot of women you went to their first Yoga class during that time. But I wanted to continue what I had done before. Well, not exactly what I had done before. Because my routine changed significantly during both pregnancies. Because obviously, being pregnant is a very special time. And even more so the first trimester and the following months. As much as I think that most exercises within Qi Gong are safe during pregnancy, please be careful. The same applies for Taijiquan. Some movements are easily doable, some are not. If you are a beginner, look for a teacher who is really advanced and knowledgable. I heard of teachers who would not take new students in their first trimester. Thus I really recommend that you start Taijiquan and Qi Gong before you are pregnant. Traditional Chinese Medicine actually has some great ways to help women becoming pregnant! And obviously, the more relaxed you are, the better. Before I share my routine, I have to admit that I could have practiced more during my pregnancies. I would say I did some exercises for like half an hour a day. I definitely could have practiced more (and nowadays I regret that I didn’t). However, I spent a lot of time resting, sleeping, eating, knitting, dancing, and enjoying life. I think that is really the most important advice for expectant mothers: BE HAPPY! Now, let’s talk about WHAT I practiced. And that was actually a quite simple routine. For my Tai Chi during pregnancy, I continued to do my long Yang form. I knew it quite well and I felt really comfortable in it. Specifically, I preferred the first section. Because the kicks in the second section as well as the snakes in the third section did not feel right for me. But I felt really fine and relaxed with the first section of the long form. Thus if you already know a Taijiquan form, my tip is: just do the moves that feel right for you. You can get into the more advanced stuff again when the child is born. With my Qi Gong while pregnant, I did only very few different exercises. I would sometimes try exercises like circling the arms or waking the Qi etc. But the most powerful Qi Gong exercise during both pregnancies was definitely: circling the hips. And I did A LOOOOOOOT of that. Basically, my simple routine as a mother-to-be was: circling hips and running the form. And occasionally some meditation or other exercises whenever I felt like it. Really simple, right? Let me explain why I concentrated so much on circling the hips. 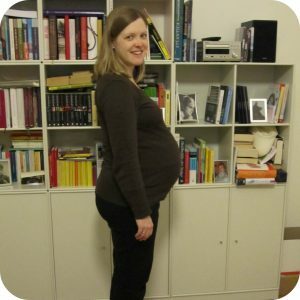 First of all, it felt really utmost comfortable to move my body and the baby inside in those circles! Second, I didn’t want to do anything that put emphasis on going DOWN. Especially wide and low stances (like a wide Ma Bu) really felt like the baby would just fall out immediately. So I decided to not do those kinds of moves and exercises in pregnancy. Thirdly, there is one more thing I would like to tell you about the circles. It may sound really strange, but in the beginning I only circled CLOCKWISE. Because I learnt from a teacher a few years ago that circling clockwise helps to bring energy up from the ground. However, around week 38, when the doctor said it would be ok if the baby would come now, I changed that. During the last 2-3 weeks of my pregnancies I would circle AGAINST THE CLOCK. Again, I learnt previously that would bring the energy down to the ground. So during the last weeks I really concentrated on bringing that downward-action into play. And both kids chose their time perfectly. And giving birth was – well – giving birth. I will talk about that experience in a separate post. Overall, I had two wonderful and easy pregnancies. I “blame” my practice, my lazyness, and my acupuncturist for it ;). Yes, I went to see an acupuncturist. And even though I know some very capable midwifes who offer acupuncture, I recommend you go see an acupuncturist. I mean, would you talk about breastfeeding issues with your accupuncturist? No, you want to talk to your midwife about that. And the same applies for acupuncture: go and see an expert! Coming to an end, if you wonder if Qi Gong and Tai Chi during pregnancy is safe: I think it is mostly. There are many safe exercises and hopefully you have a teacher who can help you. Just remember that you should not focus on going low in the early stages of pregnancy (e.g. big low stances). For more information, read these guidelines about Qi Gong during pregnancy (actually I am quoted in them! ), read some more tips on Tai Chi while pregnant and here is even more information. If you already know a bit about Qi Gong, you could try these Qi Gong exercises for pregnant women. And even though it wasn’t available during my pregnancies, I know that the meditation app Headspace now has a meditation series for pregnancies. I think that is a really good idea! Overall, being pregnant is a great time to get to know your body. Feel your body. Feel what is right for you and go for that. And ignore the rest. This is actually a very valuable preparation for motherhood. Because once you are a mother, everyone will have an opinion of what is best for you. So take your time and learn how to relax. Learn how to know what is best for YOU. And of course, I wish you all the best for this exciting time! If you like, I also shared my Qi Gong birth story here. P.S. : I heard that Gisele Bündchen actually did Tai Chi during pregnancy! Disclaimer: I am not a medical expert, I just share my personal story about Qi Gong and Tai Chi during pregnancy. Before you try any of the things that I wrote about above, talk to your Taijiquan or Qi Gong teacher, a doctor, your midwife etc. Remember that you are fully responsible for what you do with your body – especially if there’s a baby inside. I wish you a wonderful time discovering yourself and your child! This entry was posted in Motherhood and tagged being a mother, Gisele Bündchen, kids, mindset, Qi Gong, Taijiquan on 2017-06 by Angelika Fritz.